The latest version of the Hobie i12s incorporating the Vantage CTi Seat and updated MirageDrive 180. The Hobie i12s is the ideal choice for those looking for the performance offered by the MirageDrive system but that don't have the space or means of transportation for a solid hull. The i12s packs away into a compact travel bag with wheels to make it easy to move around off the water. It is constructed from robust and durable 1000 Denier PVC with drop stitched floor that provide excellent rigidity and stiffness. Quick to inflate and deflate and easy to re-pack in its travel bag. Its performance is equally good offering excellent forward speed thanks to the Mirage Drive system combined with unparrelled stability - who says you can't have it both ways! We offer a delivery service for the Hobie i12s to home and work addresses throughout England, Wales, Scotland, Northern Ireland & Ireland. Buy a Hobie i12s online from our website and collect from our store in Newhaven, East Sussex or from any branch within the Canoe Shops Group. There is no cost associated with this*. 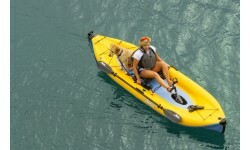 We can now offer 0% Finance on the Hobie i12s (0% APR Representitive).